W/C Bamburg is a fascinating Bavarian village in Germany. 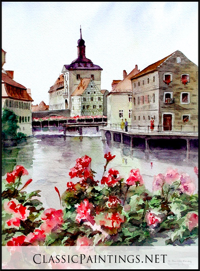 Its medieval architecture, river, and flower boxes in the summer time lend a delightful air. The jousting on boats on the river is part of summer celebrations. 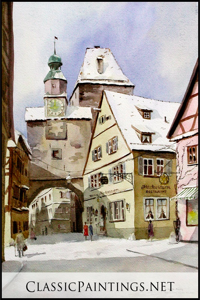 The cafes and "biergartens" and narrow winding streets provide a delightful interlude in which to wander. 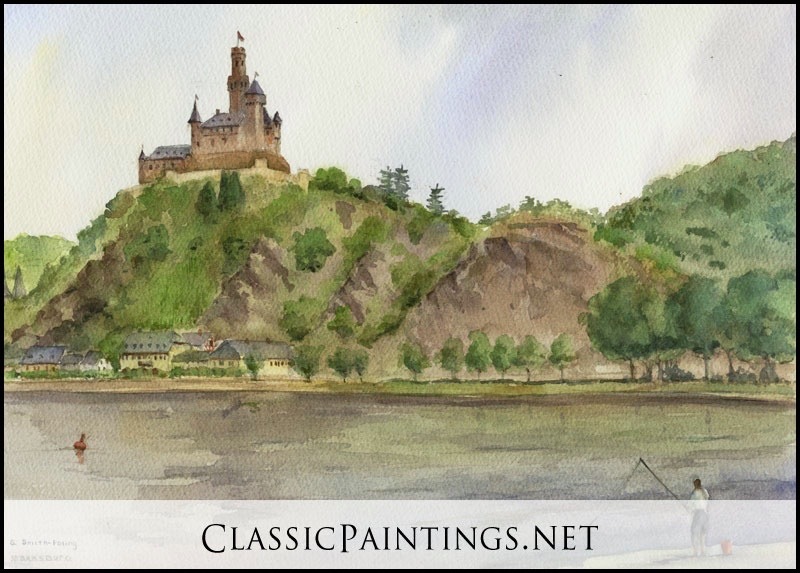 W/C Marksburg Castle is the only hill castle on the Rhine that has never been destroyed. It has been lived in for over 700 years. On the Rhein above the town of Braubach, sits Marksburg Castle. Beginning with the construction of the keep in the 12th century, the castle grew into its present shape throughout succeeding centuries. Artists Note: My father, Craig Smith, and I painted together on this beautiful summer day. Very opportunely a young boy came to fish just as I was trying to decide on what to place in the foreground. 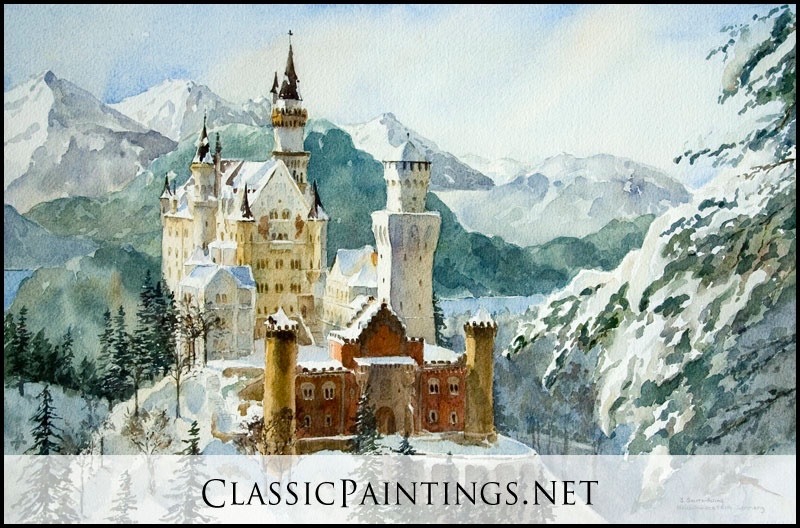 W/C The delightful, fairy tale castle of King Ludwig of Bavaria is depicted here at Christmas time. We spent several Christmases in Bavaria skiing and enjoyed visiting the castle. 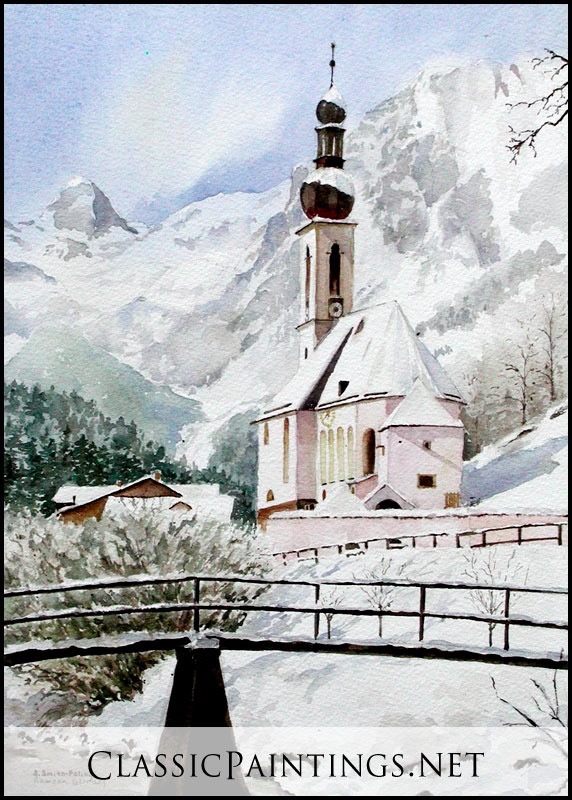 I have painted it in all seasons just for fun. Of course my children love this castle. It was the original inspiration for the Disneyland castles. It saddens me that the Burgers of the day had Ludwig declared incompetent in order to get control of his money to wage war. He was a gentle pacifist, not interested in fighting and of course they lost to Prussia. Of course his castles now have brought more tourist income and good for Bavaria, than all the wars! W/C The Greek/Russian Chapel in Wiesbaden was built from a tragic love story. The German Prince married a Russian Orthodox princess and brought her to live in Wiesbaden. She was beloved by her subjects for all her good deeds. Tragically she died in childbirth. There was no orthodox cemetery in which to bury her, so he built this chapel for her to lay instate and also had a cemetery consecrated next to it. It lies on the hill overlooking the beautiful valley and city of Wiesbaden. 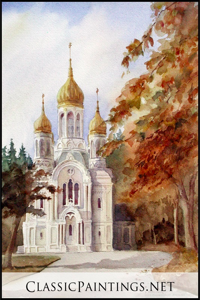 My family and I lived here four years and I enjoyed many walks and around this chapel as well as painting it. W/C The Pfalz bei Kaub was basically a toll station in the Rhein river to extract payment for ships cargo both up and down the Rhein. There were several feudal land holdings along the Rhein that attempted rather successfully to extract the tolls. 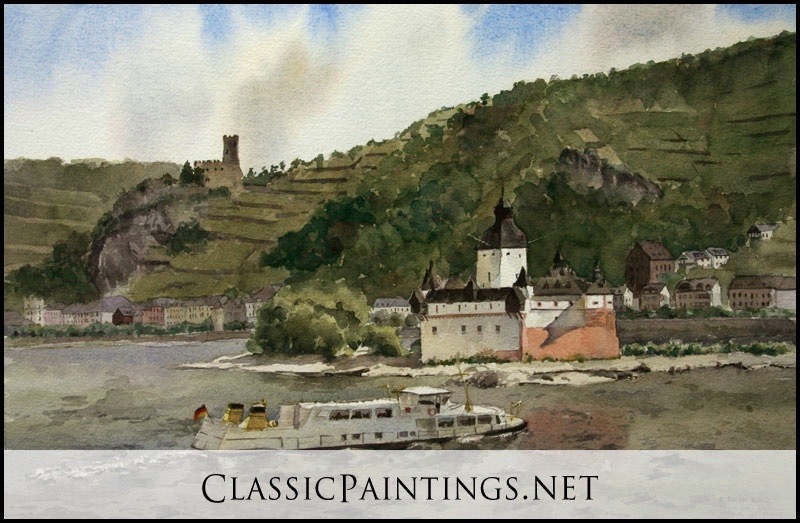 My father and I enjoyed a pleasant day painting together and remembering our previous excursions along the Rhein in the 1960’s. W/C This chapel was a delightful surprise view. 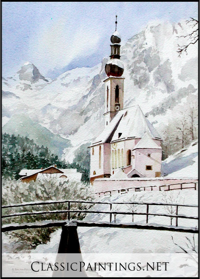 We were skiing in Bavaria and I was recovering from a cold so I decided to look for painting material that day instead of the exertion of skiing. I stumbled upon this very picturesque chapel and knew I had to paint it. The original I gave to my daughter for her 10th birthday. I always enjoy the play of light and color on snow and have fun depicting the multiple colors in the shadows. W/C The delightful, medieval village of Rothenburg on the river Tauber is depicted here at Christmas time with the snow- covered buildings and street. Untouched during the wars, it has a fascinating medieval wall, half-timbered, leaning buildings and during the holidays a very festive air. We stayed in the Youth Hostel for a few days during two Christmas seasons. My son, Andrew, said he wanted to live here when he “grows up.” Also this is where the German glass Christmas bulbs are made and marketed. 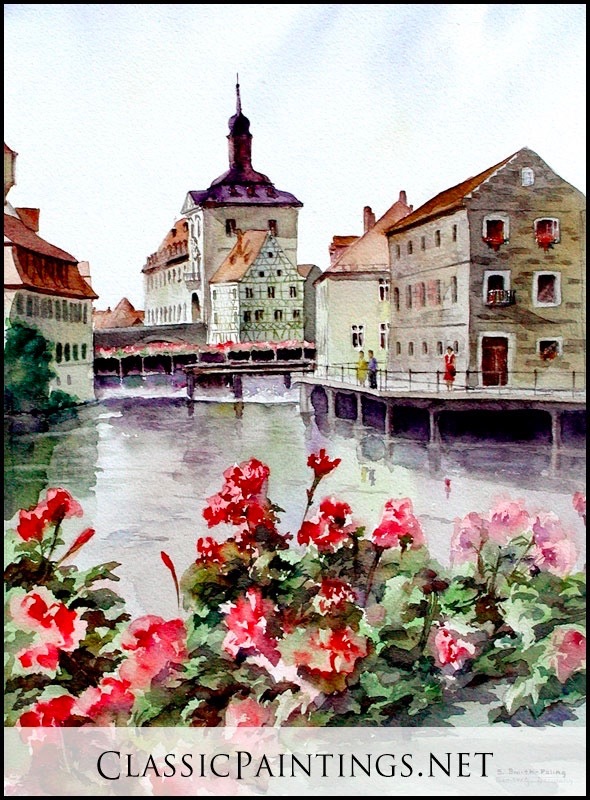 I love this village and have painted it in all seasons and many different aspects of its many towers.